The Barangay Tawid was created in the year 1965 through the effort of the former Mayor Teodulfo Amora. 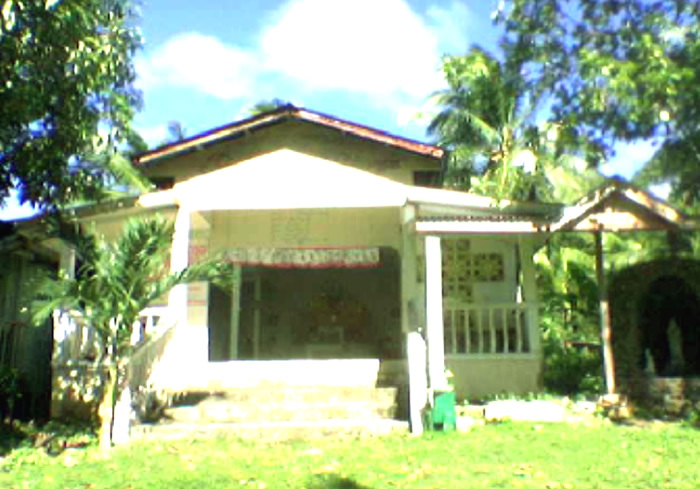 Nestled in the vast plain approximately 1 kilometer from Poblacion. Bounded on the North-Brgy. Casica; South-Brgy. Bacong; East-Brgy. Poblacion and on the West-Brgy. Almaria. The name of the barangay was believed derived from the vast plain of land area which the old folks called it in their native twang “Tawid”. It is characterized by level to gently sloping terrain, relatively flat and some parts of it are swamps which are dominated by trees or shrubs. Currently, these areas are now farmed with different rootcrops, rice and corn. Swamps are also now transformed into fish pond which has a variety of fishes more specifically bangus. It is also inhabited by crabs, prawns, clams, among others. Public cemetery is also situated in this barangay and further where the body of the famous “Inday Potenciana” rested, which draws a lot of tourists from different parts of the town and even abroad. The water reservoir that supplies the some barangays in the town is also located in this barangay. Majority of the people are engaged in farming. Barangay Tawid is still blessed with lush greenery and gentle rolling slops of the hillsides plus the stunning scenery of its nature. INDAY POTENTICIANA’S CHAPEL – Conveniently situated beside Municipal Cemetery, the remains of Potenciana Saranza or commonly known as “Inday Potenciana” was believed to be mysterious and miraculous. Several people could vouch how they were healed by this woman and shockingly found out that she’s already passed away. She was born on May 19, 1927 at Poblacion, Anda, Bohol. Her parents are Mamerto Cagata Saranza and Pilar Amplayo Escobal. She studied her elementary education at Anda Central Elementary School and finished her high School and College at Central Visayas Institute with a Teachers’ Degree. At the age of 26, she practiced her educational degree at Bincalan Elementary School, Misamis Oriental. According to those who knew her, she was so kind, helpful, hardworking and effeminate. A year later, on April 1, 1953, she was about to go to Poblacion of Misamis Oriental when she got a ride to a logging truck due to lack of transportation when the truck inevitably crashed on a coconut tree. Due to fast and powerful impact of the truck, Inday Potenciana was moved out from truck bumped on the coconut tree. She was dead on the spot in the cause of Internal Hemorrage. Her uncle, Fortunate Amper took care and buried her body at Gingoog Cemetery. Nine years later she was transferred to Anda via motorized outrigger boat owned by Quirino Visaya. She was again buried in their home ground in Poblacion near Quinali Beach. After one year, the Regional Health Officer, Dr. Garcia had came to his attention that the body is decaying, thus, he’d seen an imperative defense by transferring her body to the municipal cemetery. They enlisted the support of the Jail persons to move out from the ground. Finally, when the coffin was out from the ground, the community was startled what they had seen. Her body wasn’t off. Just like few days ago she was buried. Dr. Garcia sprayed anti-bacteria to her body and then finally buried in the Anda Cemetery. One month later, Dr. Garcia reportedly died for high blood but according to the townfolks and followers of Inday Potenciana, he was being terrified and dreamt of his being injustice and unbeliever. Though shrouded with mystery followers still amass themselves every Fridays and Mondays of April, in commemoration of her death anniversary and thanking her for her good deeds. STA. CRUZ FIESTA CELEBRATION – The fiesta will start on April 24 and ends up on May 4. It willl consequently be held with Basketball tournament of different levels, grand discos, exciting fun & games, nightly shows, grand coronation, grand reunion of balik-tawid on May 4, among others. PAMASKONG HANDOG – Witness the entire barangay comes alive in a blaze of twinkling lights that beckons the yuletide season. Gape at fireworks exploding into a brilliant curtain of golden showers in a black sky on the Christmas Eve. Truly, a different experience touched with the warmth people of Barangay Tawid. On the advent of Christmas season, a basketball treats to all youth and a grand Disco will take place on Dec. 25 sponsored by the SK.